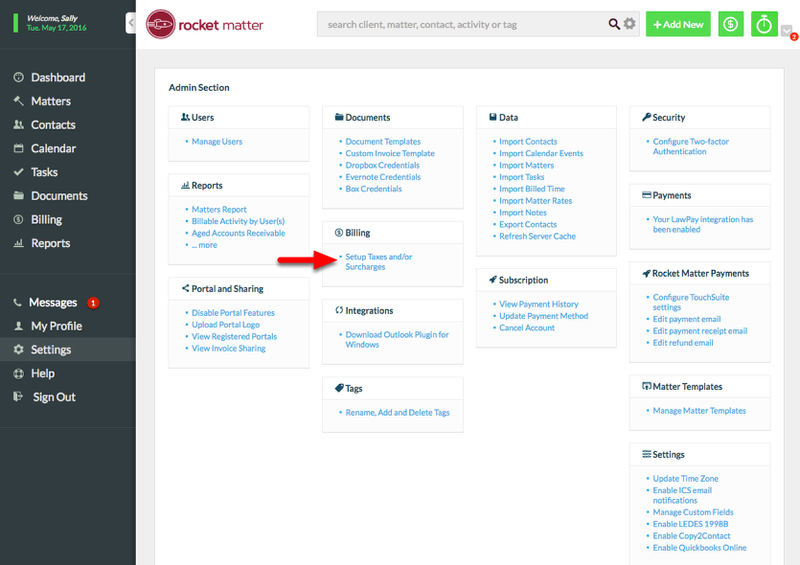 Rocket Matter Knowledge Base Additional Billing Options.How to set up taxes. 1. 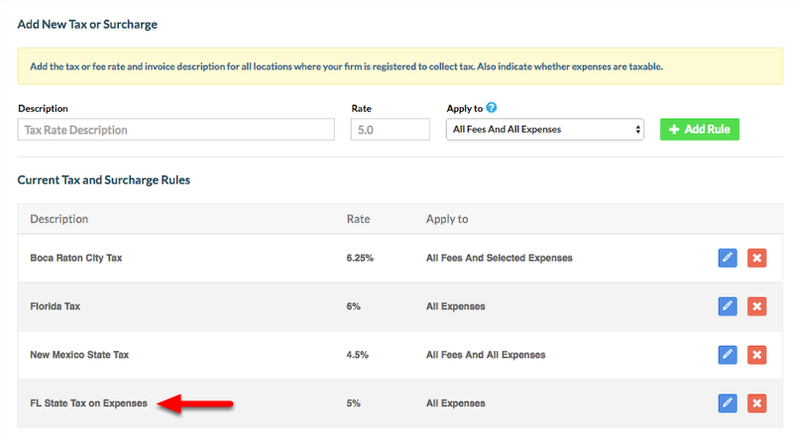 Navigate to your Admin Section, and click "Setup Taxes and/or Surcharges". 2. "Add Tax Rate Description" and Rate. Zoom: 2. &quot;Add Tax Rate Description&quot; and Rate. 3. Determine what combination of Fees and Expenses you want to apply the Tax to. - All Fees and All Expenses: Your tax will be applied to All Fees and All Expenses. All Fees and all Expenses in your Matter will be taxed if you choose this option. - All Fees and Selected Expenses: Your tax will be applied to all fees, and will not be selected by default to apply to any expenses. You will have the opportunity to apply tax to select expenses in your Matter if you choose this option. - All Expenses: Your tax will not be applied to any fees, and will be selected by default to be applied to all expenses. All expenses will be taxed in your Matter if you choose this option. - Selected Expenses: Your tax will not be applied to any fees, and will not be selected by default to be applied to any expenses. You will have the opportunity to apply tax to select expenses in your Matter if you choose this option. 4. 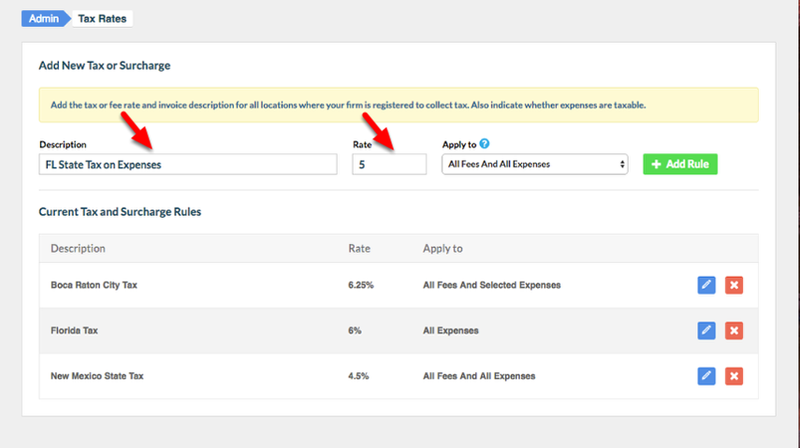 Select what combination of Fees and Expenses you want to apply the Tax to. 5. 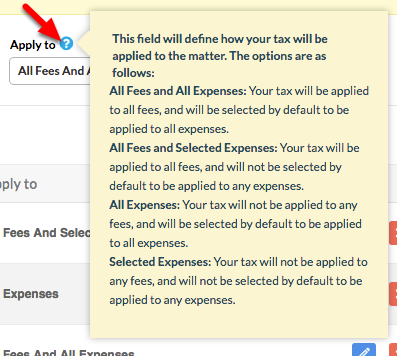 Click "+ Add Rule" to save the Tax setting. 5. Your Tax Rule is now available to apply to a Matter. Prev: How to apply taxes to a matter. Next: How to set up convenience fees.